On the 27th of November, 2015 - the news broke that a suspected Boko Haram suicide bomber attacked crowds at a Shi'a (Shiite) Muslim procession numbering thousands near the north Nigerian city of Kano, in the latest violence to hit the troubled region. The attack happened in the village of Dakasoye, some 20 kilometres (13 miles) south of the city, during a march by followers of the Islamic Movement of Nigeria. This led to the death of approximately 22 members of the sect with about 60 others critically injured. The following day, a new twist to the suicide attack emerged from the leadership of the Shiite sect led by Sheikh Ibrahim El-Zakzaky which stated that the attack was not orchestrated by Boko Haram members but another warring party. "We know the names of the contractors and those contracted to commit the massacre. Their identity is not hidden from us. Therefore we cowed by an imaginary Boko Haram tale. Let them tell it to the fools and ignorant." "They should know that they are dealing with those with foresight, wisdom and intelligence and above all with the real religion." The group stated the perpetrators were known to them and the tone of the revelation was like a drum sound of war. As a Nigerian, I was disturbed by the insinuations. It was obvious a feud was brewing with other parties. My instant fear was the existence of another deadly terrorist sect aside Boko Haram which has claimed the lives of an average of 17,000 Nigerians since 2009 and displaced about 2.6 million others. It was obvious the incident was set to give birth to another bloody occurrence but my premonitions were simply subjective. On Saturday, 13th of December 2015; the online news media shifted from the Sambo Dasuki armsgate after weeks of reportage to an alleged clash between the Shiite Muslims and the Nigerian troops in Zaria, Kaduna. The Shiite Muslims were reported to have made a failed assassination attempt on the Chief of Army Staff, Lieutenant General, Tukur Yusuf Buratai. This led to a gun duel between the Nigerian troops and the civilian sect. Incidentally, blood started flowing like a river. The death toll started rising dramatically according to wide media reports from 6 to 10 and then 20 to 30. Highly controversial online news platform, SaharaReporters was quick to put the death toll at 100 and yesterday, Tuesday, 15th of December, Channels Television put the figure at 60. Other media platforms put the death toll at 200 and 1000. What a holocaust! This attack is a sensitive issue which shares a historical resemblance with the growth of the Boko Haram sect (making reference to the death of the late leader of the sect, Mohammed Yusuf under questionable circumstances) which has become a plague we may end up living with for many years to come in Nigeria. Chief of Army Staff, Lieutenant General Tukur Buratai was interviewed and I was expecting a vivid account of the ill-fated incident only for him to claim the members of the Shiite Muslims barricaded the main road outside their prayer centre and prevented his entourage from going to their destination. All means of appeal to the resistant Shiite faithfuls which were numbered about 500 reportedly failed. They got violent and an attack ensued. Buratai then referred us to the video clip recorded by the National Television Authority, NTA, for details, and the footage is yet to be released for unknown reasons. Buratai attributed his survival to an act of God. Again, details of how God did it remains undisclosed. Another conflicting account from one Ojo Momodu, an eyewitness claimed the Shiite faithfuls barricaded the road with burning tyres and stoned the vehicle of the Chief of Staff. This seems like a trivial case of a battle for influence, a blood bath would have been averted if viable crisis control mechanisms were employed by the military that are expected to know better. A similar occurrence took place on the 22nd of January, 2015 in Bauchi state during the presidential campaign involving former President Goodluck Ebele Jonathan. Some thugs who converged at the Ibrahim Babangida Square, venue of the event, hurled shoes, plastic water bottles and other objects at the canopy where the president and members of his campaign team were delivering their speeches with soldiers on ground. Jonathan didn't exercise his powers as the Commander-in-Chief of the Nigerian army; no obnoxious orders were given and the incident was perfectly managed. Another related incident also took place involving Jonathan in Katsina. Even at the international scene, United States of America's former President, George W. Bush during his first inauguration as the 43rd President of the United States of America had his fair share of an attack on January 20, 2001 in Washington DC. He had his limousine and his convoy pelted with eggs including a tennis ball by angry Americans who believed he stole his mandate; he ate the humble pie and bowed out of the scene gracefully with no record of a reprisal except the arrest of four protesters by security operatives. Let it be clear that I am not making any insinuations or taking sides. I am just weighing the roots of the mayhem and how it could have been ameliorated rather than putting Nigeria in the headline for another barbaric cause. Were the soldiers really engaged in a gun duel with the members of the Shiite sect as claimed in the media? If yes, the Nigerian military should provide the arms and ammunition employed by the sect during the attack as the Army have always done when displaying their victorious pictures against members of the Boko Haram sect or else this action will paint a perfect image of a holocaust against the Shiite Muslims. Secondly, the fatality of the attacks leading to the death of about 100 members or more of the sect must have been sparked by a provocative action by a Shiite member or members like a serious injury on a Nigerian soldier, death or damage of their vehicles; Is there any casualty the military has to show as evidence? Were there no better means of crisis management to be employed by the Nigerian soldiers than to brutally open fire on the Shiite Muslims leading to that magnitude of death rate? We have heard of tear gas, rubber bullets, pepper sprays, shooting of the legs of the civilians under extreme cases; how come highly trained troops assigned to protect the lives of someone of the calibre Chief of Army Staff ran out of options than to open fire on the hapless civilians? Why did the military abandon the corpses of the dead Shiite members on the street and later return for them after their bodies were heavily looted and dishonoured by unscrupulous people as shown in the viral video? Why is NTA yet to release the video footage of the violent attack which involved the pelting of stones and sticks for analysis and investigations? Does this confirm an organized cover up of the truth behind this incident if there is anything fishy whatsoever? Why did the Nigerian troops go after the leader of the Shiite Muslims, Sheikh Ibrahim El-Zakzaky who was badly injured with an alleged gunshot wound as shown in the viral photo on the internet depicting he was manhandled by security operatives? This question is necessitated by a conversation the Shiite leader had with another Shiite member in Iran who called to confirm the incident. The audio copy of the call has gone viral on the social media. Sheikh Ibrahim El-Zakzaky was heard telling the Iranian that his house was under siege by the Nigerian troops and the numbers of death couldn't be ascertained. He sounded helpless and seemed to be hiding from his death after which he was picked up by soldiers and kept in a 'protective facility' with his wife. What was the motive behind the release of the graphic image of the Shiite leader? It is safe to say the photo was taken by a military operative. The pitiable state of the Shiite leader was provocative enough to inspire a sympathizer to violence. This accounts for the reason why the United States of America till date failed to release photos of the dead body of the perpetrator of the 9-11 attacks on the World Trade centre, Osama Bin Laden. There are reports that the Nigerian military demolished the worship centres of the Shiites in Zaria, Kaduna including some part of their leader's house. If true, what was the rationale behind that harsh action which smells of a personal vendetta against the Islamic sect of 37 years? Is this bloody attack a manifestation of the rumoured cold war between the Shiite sect and the Nigerian Military in the past which prompted the sect to emphasize that it is not a terrorist group? 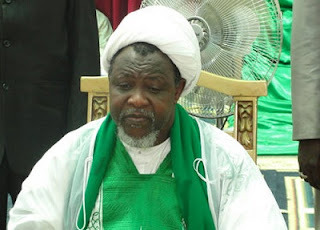 Sheik Ibrahim El-Zakzaky is an educated and well travelled man who event went as far as appealing to his followers to remain calm in a telephone interview with SaharaReporters during which he tearfully revealed the alleged murder of his sons who were Engineering students in China. Is it possible for such an assassination attempt to take place under the auspices of such a leader knowing fully well the consequences of bringing a knife to a gun fight? The predicted consequences of the massacre may go as far as affecting the diplomatic relations between Nigerian and Iran which has the highest number of Shiite Muslims in the world. Iran is keenly interested in the case. The Iranian Foreign Minister, Mohammad Javad Zarif has reacted to the controversy by summoning Nigeria's foreign envoy, Geoffrey Onyeama for an insight into the ill-fated incident. Some Muslims also staged a protest at the Nigerian embassy in Iran as well as the Indian capital. Some Shiite Muslims protested in Kaduna yesterday which reportedly led to an attack on the police leading to the death of 3 other members of the sect which security operatives denied. We have too much on our plate as a country already. We are battling the issue of Boko Haram insurgency, Biafra agitations which are waxing stronger daily, plummeting fall of oil price, youth unemployment, fall in the value of Naira, the incurable cancer of corruption and so on. I hope this doesn't lead another case of Shiite insurgency as widely speculated. Strong investigations should be launched by the National Human Rights Commission, NHRC so that justice could be done if needed to prevent the future occurrence of such a barbaric event.